The perception of vibrational consciousness has manifested in a number of individuals via the reporting of hearing tones not otherwise attributed to medications, tinnitus or other external identified sources. This study had several goals: 1) to gather self-reported information regarding whether these tones are heard by individuals, 2) the quality of the tones heard and 3) the perceived origins of these tones. Quantitative results are shown for the number of respondents that perceive tones, the quality of the perception of the tones along with the perceived origins of the tones. The results also show whether there may be a correlation between the perceived tones and the reported participation in spiritual practices such as meditation or of having a spiritual experience. A majority of responders from all age groups in the survey indicate that they perceive tones and that more than half of survey respondents believed the tones to be of a spiritual origin. The survey concludes only that there is a high perception of hearing tones from the survey respondents, that the quality of the tones is perceived differently and that while the origins are perceived to be spiritual in origin by more than half of the respondents, the origins are not necessarily clear. More studies are needed to determine the true etiology of the tones perceived by individuals. It has been noted by several luminaries in the metaphysical and new age genre of writers, teachers and those who meditate that tones are often perceived of an unknown origin. In order to better understand the occurrence, perception and quality of the tones seemingly heard, I developed a survey to gather data on the phenomenon to determine whether it could be determined valid as a common occurrence, whether there were correlations to specific age groups, gender or religious beliefs along with the qualitative data related to the perceptions. It was my goal to gather data and provide information on my findings in order to provide the community with further information on the topic and determine if it warranted further study with more rigor. Through understanding this phenomenon, we may better understand its occurrence and what messages our consciousness may be attempting to communicate to us. I believe that all of the results of our perceptions are messages presented to us for greater understanding of our existence in life. With greater understanding, we can make better use of information freely available to us through our own perceptions and experiences in life. The objectives I set at the beginning of the survey were first to validate the occurrence of the perception of tones of unknown etiology, better understand the way the tones might be perceived and attempt to discern the perceived origins by those participating in the survey. With these goals in mind, I established my survey questions. For the most part I believe that the survey met my objectives and the results speak for themselves in terms of the respondents experience of the occurrence of the perception of the tones. 100 respondents for the survey, which I held open for two months from October 17, 2014 through December 31, 2014. I issued reminder posting at two-week intervals to attempt to gather respondents. During that time, I gathered 53 responses. There was an inherent bias potential in the survey responses given the readership of my blogs and social networking community in that the associates I shared the survey request with held more of a spiritual and metaphysical focus. 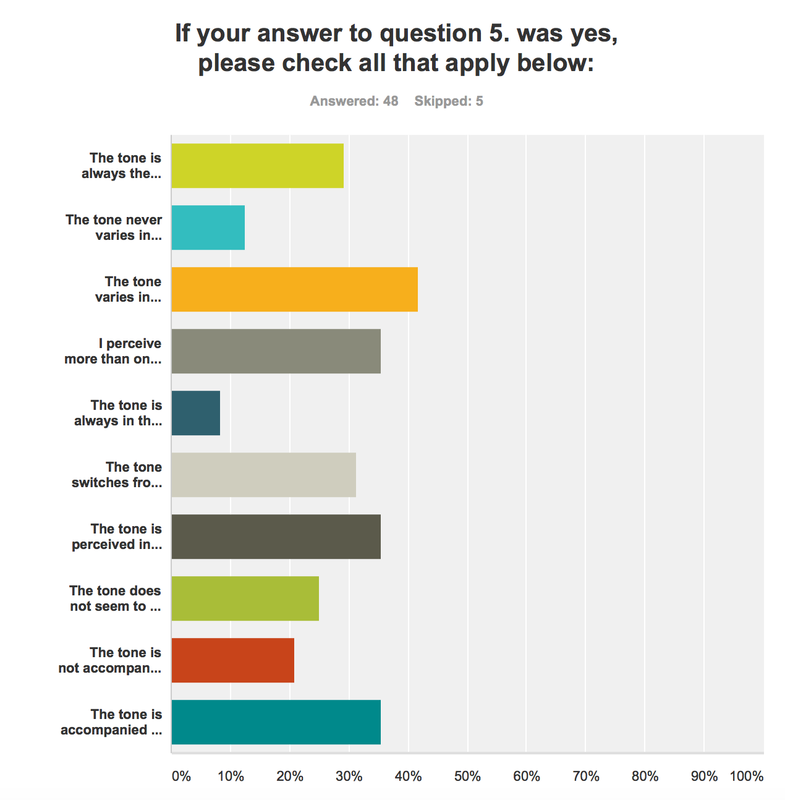 This actually worked for the survey as the genre of authors and teachers who raised the question for me as I began to assemble the concepts of the survey were of that same focus. 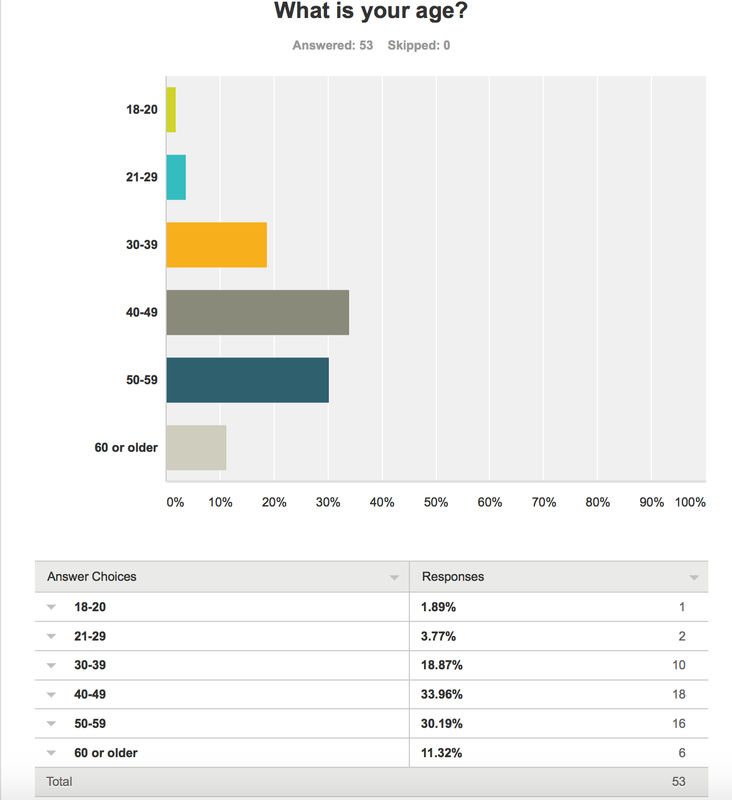 The analysis of the survey results was conducted by reviewing the individual responses. Of the 53 survey responses gathered, an overwhelming 48 individuals reporting hearing tones they did not believe where due to medication or a known medical diagnosis. One significant trend in data was that there were two main age-bands in highest volume of responders. Those were the 40-49 and 50-59 age groups. 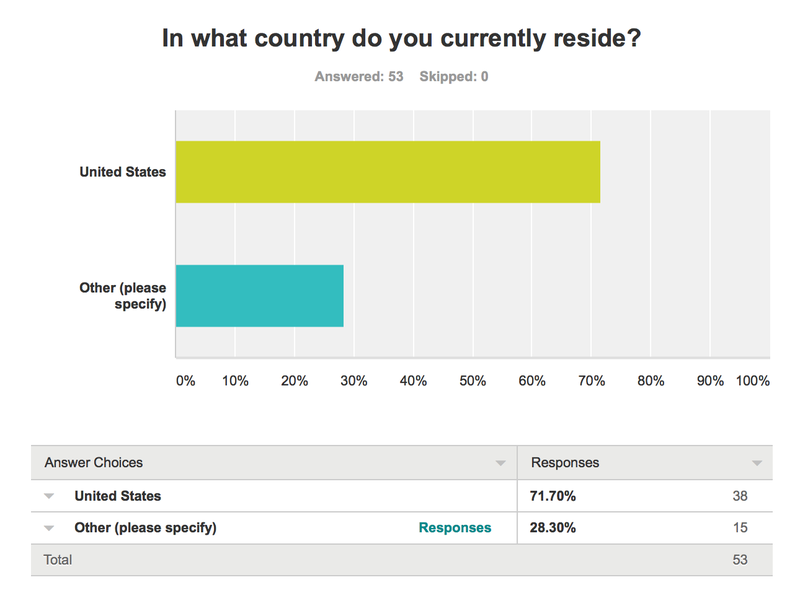 These two groups combined represent 36 respondents. Of those combined age bands, all but 3 reported hearing tones. There were no significant trends in data between the various religious beliefs held but that was a slight increase in the break out of respondents in that nearly half cited that they were spiritual and not religious or cited no religion at all. 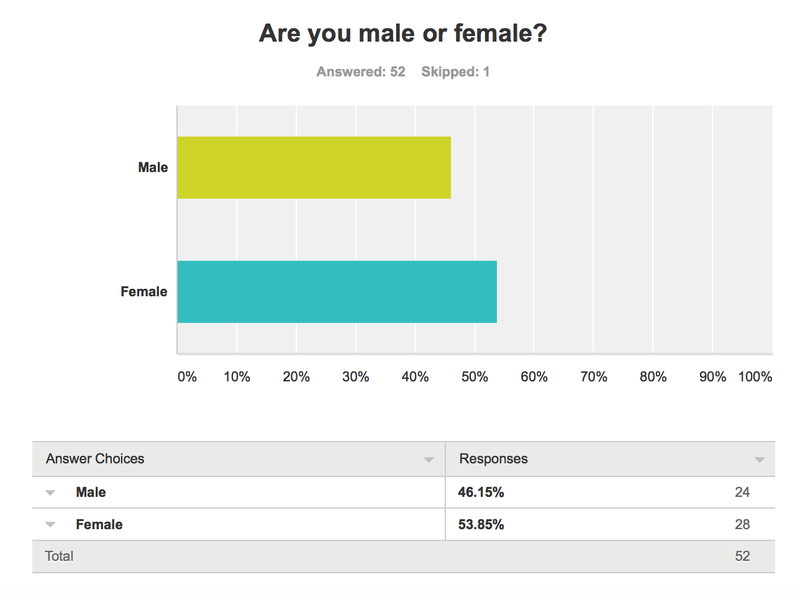 The distribution between genders was near half and half at 29 reporting female and 24 reporting male gender. With regard to the variations of the 48 respondents who affirmed that they perceived tones, the variation of the tones was interesting. All 48 reported that the tone itself was perceived as always being the same, 20 respondents indicated that the pitch never changed, 17 individuals reported the tone was always perceived in the same ear and 16 indicated that the pitch of the tone varied. 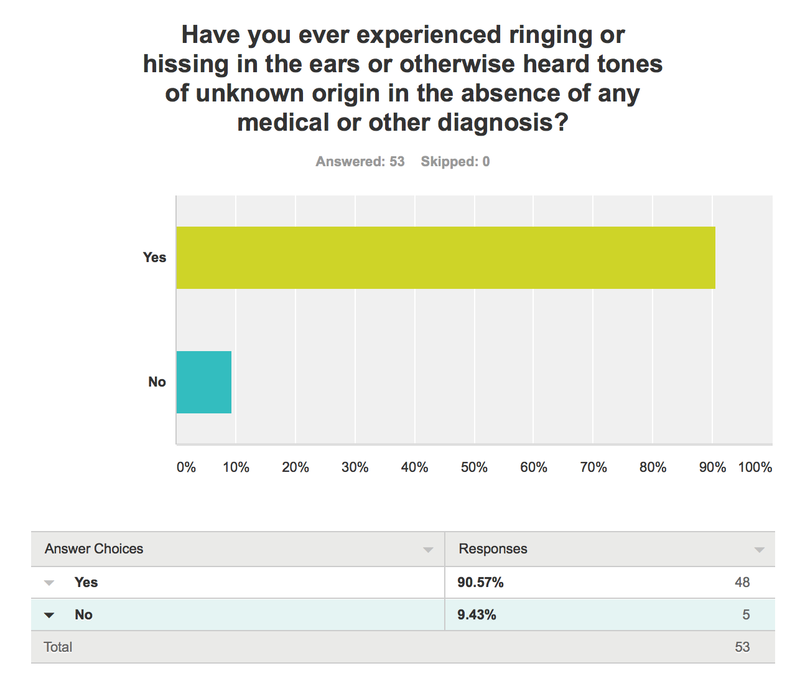 15 respondents reported they perceived the response in both ears, 4 indicated that it switched ears and 4 indicated that they perceived multiple tones. When further pressed to provide more qualitative information, 17 respondents indicated that the tones were perceived internally. 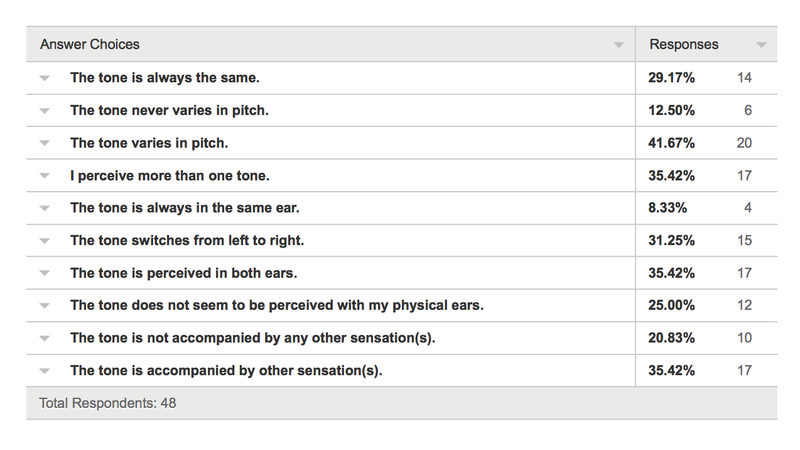 12 respondents perceived tones with no other sensations while 8 indicated the tones were accompanied by other physical sensations. 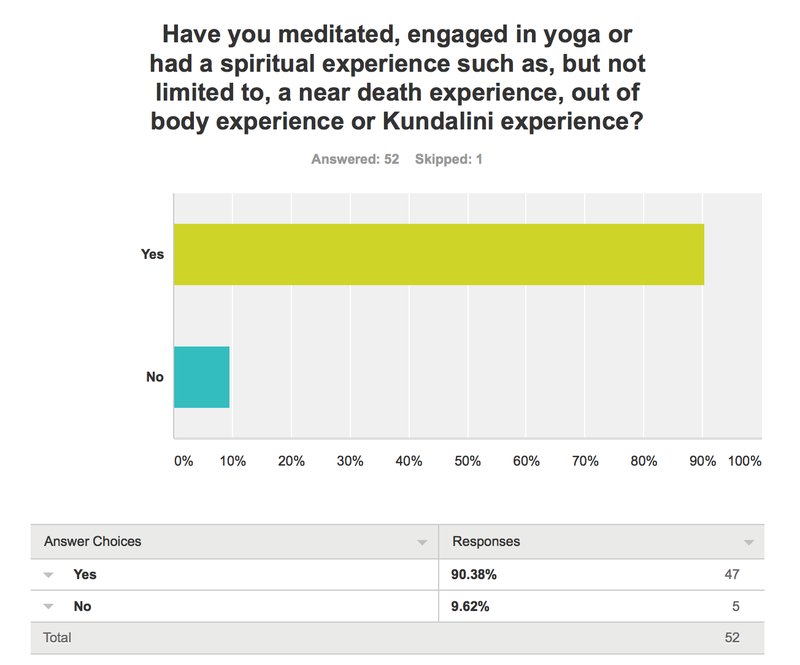 Of all of the respondents, 18 indicated that they have engaged in a spiritual practice, meditation or have had a spiritual experience such as a Near Death Experience or an Out of Body experience. Male and Female both trended at 14 citing a spiritual origin. Of the respondents reporting physical origins, 2 males and 1 female cited this as their perceived origin of the tones. With regard to the physical perception, 6 males and 4 females cited this as their perceived origin. The remaining respondents either skipped this question or cited that the origin was unknown. The following Data Tables outline the specific questions asked and the response rates by question. Each of the tables represent questions 1 through 8 in sequence. Questions 9 and 10 included only personal information to validate there were no duplicate responses and affirm permission to use responses given. 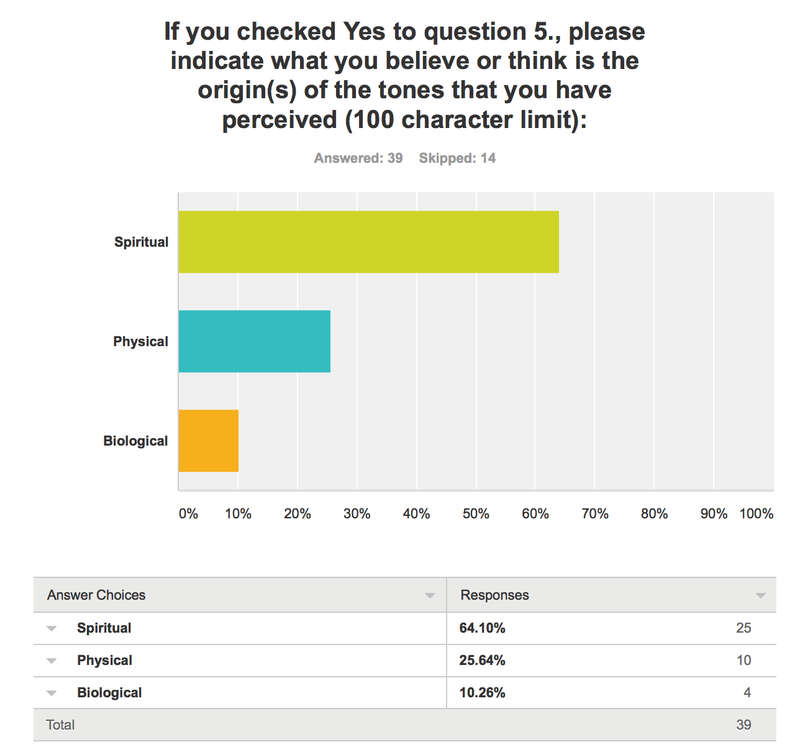 While it is clear from those surveyed, the majority experience tones and those tones widely vary in terms of the way they are perceived, the perception isn’t necessarily tied to a religious belief and the origins while perceived by the majority to be of a spiritual nature, we must acknowledge that these are the perceptions of the respondents. Similar subjectively reporting experiences are far from empirical but do seem to indicate there may be a phenomenon worthy of further exploration for deeper understanding. 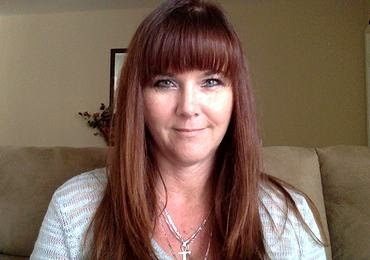 These sounds or tones as energy signatures are heard clearly by those who are religious and not, and the respondents report being unaware of any medical diagnosis or medication that could be the cause of the tones they are perceiving. The tones seem to be the same to the perceivers but sometimes they have a tendency to shift in pitch or the perception of the side of the head they may be hearing the tones more from. Some report they felt the source of the tones they experience are internal in nature rather than coming from an external source. The question remains, what is this tone that we are perceiving? 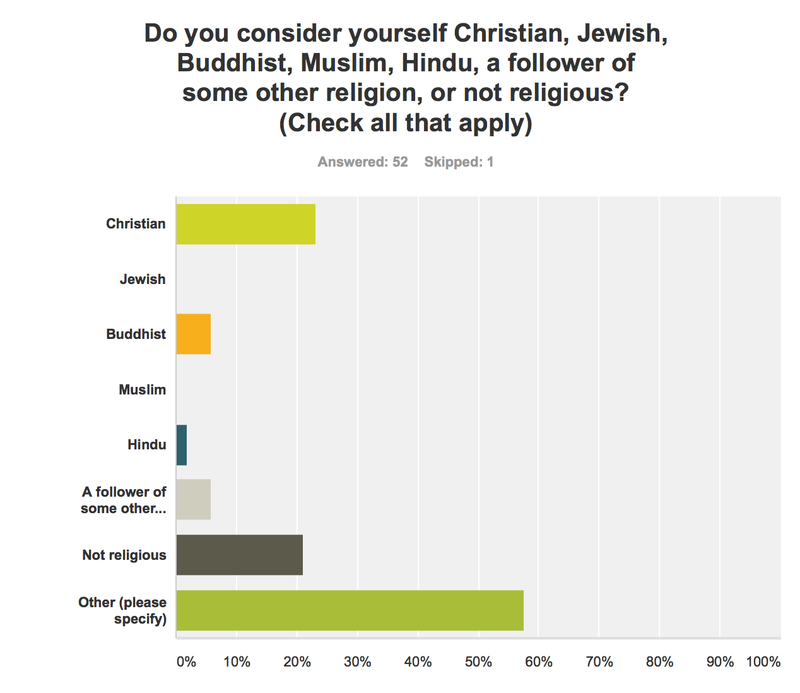 Respondents come from all over the world, from different cities, different age groups and different spiritual or religious practices and beliefs. So, what are these tones we are perceiving? Are we in some way perceiving the energy of our own consciousness? Does consciousness have a sound? After reviewing the research findings I begin to wonder. Is it merely our consciousness or could it potentially indicate something more? 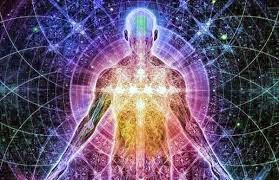 Are we hearing the sounds of the vibrating energy in the universe, in our own bodies or are the otherworldly in origin? Unfortunately, my findings do not address these specific questions but I believe they are worth further exploration for the purpose of understanding. Given that the energy vibration of tones are being perceived by some individuals on the planet, I think further study is needed to understand the true source of the tones. No doubt in some cases these perceptions can be readily scientifically or medically explained by the body’s reaction o chemicals or disease states. But what if they actually could represent the various stages of our consciousness? 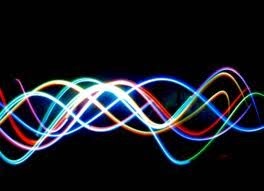 What if Alpha, Beta, Theta, Gamma and Delta states of brain wave activity have a corresponding sound perceived within our consciousness? What if there is a sound that is not simply related to blood pressure moving through the vessels heard physically? What if there are those who have no medical or mental diagnosis, no former injury to the ear, who seemingly hear things that, are not readily understood? What if our perception represents otherworldly existence in terms of energy signatures perceived as sound? What if there are other worldly dimensions from which we can feel and hear but not see? There are more questions than there are answers. In metaphysical studies we are taught that Aum is the sound of the center of the entirety of the universe and from that sound, all of creation stems. That sound is vibration and vibration is energy. I these tones myself and in my own perception, they vary in tone, in pitch and are usually coming from one side or the other although when I experience the tones and quickly inquire of others in the room, no one else reports hearing anything. I also have personally experienced very strong sensations that seemingly envelop the entirety of my physical existence and seemingly distort my perception of reality. It made me very curious as to whether others have similar experiences. The more I wrote and researched this very topic, the more I found hits here and there of others who have had these experiences. Considering myself to be an energy sensitive, having experience of specific tones right before a person I know is about to call me or send me a text message, I cannot help but wonder if we each have unique tones ascribed to our personal consciousness and with thoughts we project that outwards and others can perceive it. There are so many possibilities and little solid data to explore this. I’d very much like to see more formal exploration with a stronger scientific bent towards study of the origins of these tones and answering some of the questions I’ve posed. I think we could learn a lot more about who and what we truly are beyond the limited constructs of the corporeal existence we hold as reality. 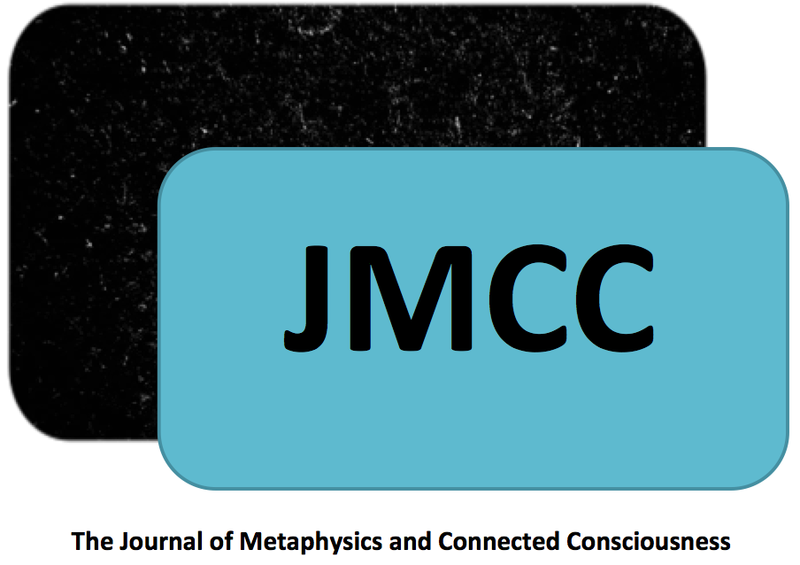 I want to personally thank all of the survey participants for their willingness to help the Journal of Metaphysics and Connected Consciousness explore this topic. Perhaps our wading into these waters may spark greater curiosity in consciousness and noetic-type studies that may help us all come to better understanding. © 2015 J.L. 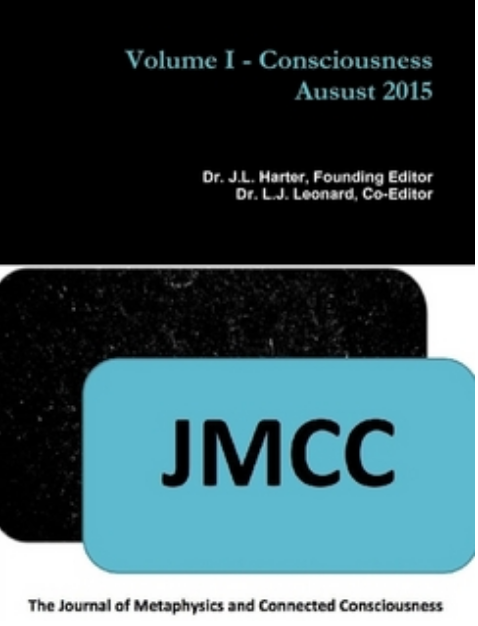 Harter, Ph.D., Founder of The Journal of Metaphysics and Connected Consciousness and The Ministry of Connected Consciousness, California, USA.